The new UK Regional Edicion for 2013 follows in the esteemed footsteps of two remarkable cigars launched 22 years apart. The original Robusto sized Flor de Cano Short Churchill was released in the late 1980’s but was then discontinued in the early 1990’s. Despite its brief production run, the Short Churchill quickly gained a reputation among aficionados. Since then it has continued to be extremely sought-after. A box of 25 recently sold at auction for the remarkable sum of £6,600. It was this cigar that provided the inspiration for the 2010 UK Regional Edition, the Flor de Cano Short Robusto. This phenomenal little cigar went on to become one of the most popular UK Regional Editions ever. The Gran Cano measures 141mm x 50 ring gauge and is therefore a Gordito. It has been produced in 5000 numbers boxes of 10 cigars. Care in replicating the Flor de Cano blend as well as the unique green ink hot stamps on the boxes remind us of old Havana. 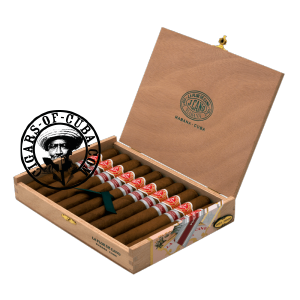 The box includes a replica of a papeleta (the colourful end label) dating back to the 1930’s and the cigar will be dressed with a redesigned band that carries the name of the cigar.